At a recent blind tasting in London arranged by Farr Vinters and attended by a select group of wine professionals, including Neal Martin and Jancis Robinson, Kumeu River Chardonnays were compared with some of the finest white Burgundy equivalents (not equivalent in dollar value, the Kumeu River wines being a fraction of the price). Of the four flights tasted – 2012, 2010, 2009 and 2007 – the Kumeu River wines achieved the highest score in all but one. Here was a chance for L and I to attend a (sort-of) recreation of this tasting at Glengarry Wines new premises on the Old Hutt Road. The tutored tasting was hosted by Michael Brajkovich, winemaker at KR, and New Zealand’s first Master of Wine (MW) He holds a Bachelor’s Degree in Oenology from Roseworthy College in South Australia, and is a member of the Institute of Masters of Wine in London. Kumeu River vineyards are located 15-30kms from the ocean, west of Auckland. The climate is moderate, with a semi-tropical influence of rain and cloud cover on the vines. The first vineyard was established in 1944, but production has expanded to include grower sites that provide fruit for harvest by KR. Since the 1980’s there has been a move to lower-vigour root-stocks with less leaf growth so as to divert more energy to ripening the fruit, and the use of malolactic fermentation for biologic de-acidification of the wines. Kumeu River Estate Chardonnay 2013 – $26.99 – This is a district blend from various Kumeu vineyards, and is a level above the KR ‘Village’ designation. Pale gold colour. Aromatic, clean nose, lightly oaked, a little closed. In the mouth I saw bright acid notes, fresh stonefruit and citrus flavours, mouthwatering, tight, and with a lovely finish. Dom. Bellene Savigny Les Beaune 2010 – $49 – Produced by N Potel. Light gold vibrant colour. Aromas of honey and honeycomb, a mineral character, elusive, some botrytis perhaps. There was firmness and grip to my taste, with tannins and texture and bright ripe fruit. A sharp flinty finish. Redolent of foreign terroir. A lovely wine. Alex Gambal Puligny Montrachet 2011 – $79 – Light gold. Warm baking aromas, with vanilla, marmalade and buttered toast. Round, fully developed and ready. Mineral-y, and somewhat flat compared to the Coddington, but still immersive and delightful. Wow. 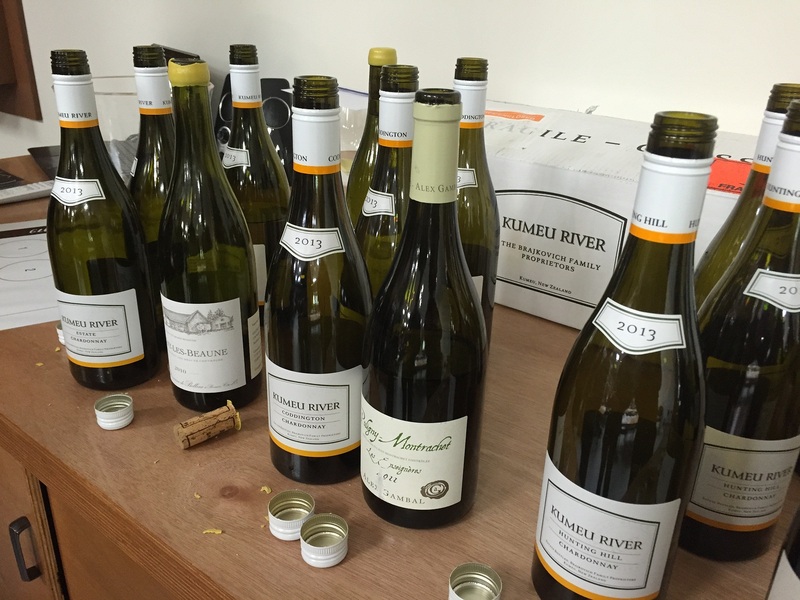 The Kumeu River wines showed well against the established French rock-stars. They showed great freshness and typicity and sense of place, whereas the French examples showed that they were from all over the place. The more youthful Kumeu wines also showed great freshness against the older and more developed Burgundys, which were able to exhibit more character and complexity from a few more years in bottle. Perhaps screwcap closures have a part to play here? It would have been interesting to see them compared with wines of the same age, but perhaps that is for next time..
A superb illuminative tasting, and many thanks to Michael Brajkovich and the team at Glengarry. This entry was tagged Chardonnay, Kumeu River, Wine of France, Wine of New Zealand. Bookmark the permalink.